Critical reproductive health programs are under attack and we need your support now. Last week a House Subcommittee passed a Fiscal Year 2016 spending bill that eliminates ALL funding for both the Title X Family Planning program and the evidence-based Teen Pregnancy Prevention Program (TPPP). These programs have proven to reduce teen and unplanned pregnancy and abortion while saving significant taxpayer dollars. 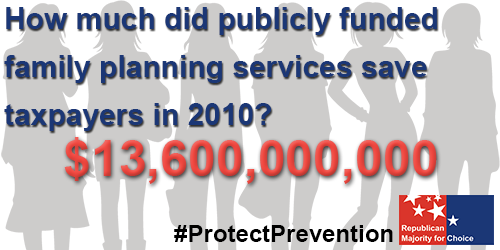 For every dollar invested in publicly funded family planning services, over $7 dollars are saved in Medicaid spending. As Republicans, we know the significance of proven-effective, cost-effective programs that aim to reduce the rates of unintended pregnancy, teen pregnancy and abortion. These are the kind of fiscally conservative, family-first policies that Republicans should take the lead on. Tomorrow the House bill will be reviewed again and today a Senate Subcommittee will discuss potential cuts to these proven-effective family planning and teen pregnancy prevention programs in their own budget. These proposed cuts to proven-effective programs are misguided and will have devastating social and fiscal consequences for millions of families and taxpayers. The full elimination of the Title X family planning program and the Teen Pregnancy Prevention Program (TPPP) shows a lack of understanding about the importance of prevention and family programs that lessen teen pregnancy and abortion – goals that Republicans should be championing. 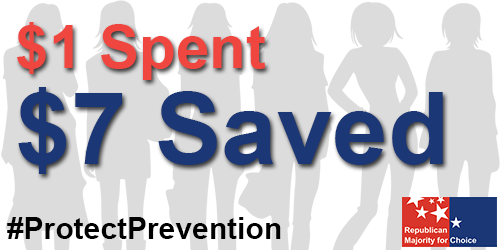 Contact your Representative and Senator today and urge them to continue fully funding the evidence-based Teen Pregnancy Prevention Program (TPPP) and the Title X program for Fiscal Year 2016. To find out who your member of Congress is, click here. Like RMC on Facebook and share one of our graphics to spread the word about the importance and effectiveness of family planning funding. It may be Summer – but RMC isn’t taking a vacation. We are on the Hill every week and we need your continued support. Consider making a donation to RMC’s lobbying efforts today! Help RMC get the word out now — Republicans in Congress need to know there is real conservative support for these critical programs. And remember: The Title X family planning program and the Teen Pregnancy Prevention Program (TPPP) in question do not fund abortions. There is no federal funding for abortion services.